Yarrow is a plant that has been used for centuries in traditional medicine. It is also commonly known as achillea, bloodwort, carpenter's weed, devil's nettle, nosebleed, old man's pepper, staunchweed, thousand-leaf, and wound wort (among other names). But, does it work for the wide variety of elements it's been used to treat? As is common with herbal supplements, we don't yet have enough research to say for sure. However, preliminary studies do show promise for this herb in multiple areas. The flowering portion of the yarrow plant is what is typically used for medical purposes. Yarrow isn't just a single plant, though—the name is applied to about 140 different but closely related varieties that fall into the genus Achillea. According to one study, the wide number of plants in this family is a complicating factor when it comes to research—some reviews state that studies haven't always been clear enough about which exact variety they're studying, and that makes it difficult or impossible to compare research and draw conclusions. Still, we're learning more about yarrow and what it may offer as a treatment. Yarrow plants have been researched for a wide range of health problems and ailments that it has been traditionally used for. The following uses all have some studies associated with them. However, most of them have been performed on animals or on cells. Human trials, so far, have been rare. That means research is in its early stages and the findings have to be replicated in larger and more in-depth studies before we know for certain what medicinal benefits yarrow has—and how safe a treatment it is. A 2017 review of the medical literature on the yarrow plant called achillea millefoilum L. listed several medicinal uses of the plant that have shown promise in studies. One of those uses is as a topical anti-inflammatory. Multiple studies support its anti-inflammatory action. A 2017 paper in The Journal of Ethnopharmacology said it had an "evident anti-inflammatory property" with a positive impact on the pH balance of the skin and its moisture content. Achillea millefoilum and achillea asiatica both have had positive preliminary results in a topical application for wound healing. In a 2017 study on achillea asiatica extract, researchers concluded that the herb was effective at improving skin wounds in rats through multiple effects at the cellular level. A study out of Africa demonstrated an anti-spasmodic effect of achillea millefolium L. in part of the digestive system, which means it may be beneficial in conditions that involve spasms in the digestive tract, such as irritable bowel syndrome. A 2015 review of the anti-anxiety properties of essential oils found that two varieties of yarrow—achillea umbelata and achillea wilhemsii—did appear to help lessen anxiety. Researchers said it appeared to have this effect with a different mechanism of action than the popular anti-anxiety drug class benzodiazepines. A 2017 study out of Iran supports the use of achillea millefolium in neurodegenerative disease, including multiple sclerosis, Parkinson's disease, stroke, and epilepsy. This conclusion is based on findings in animal studies. In multiple sclerosis, researchers say the supplement lessened disease severity, lowered neuroinflammation, and reduced the number of demyelinating lesions. In Parkinson's, they say it improved motility and muscle tone. In strokes, it appeared to reduce the infarct volume, and in epilepsy, it reduced the seizure severity. There's no established safe or standard dosing for yarrow, and the amount that's needed to be effective may vary from person to person depending on several factors as well as what the yarrow is being taken for. Yarrow supplements are available as capsules, tablets, essential oils, and tinctures. Always follow instructions on product labels and include your doctor and pharmacist in your decisions. Look for yarrow supplementation that is certified by a third-party if purchasing it in a store. Otherwise, you can plant your own yarrow. It thrives in dry and warm climates and is typically grown during springtime. However, some groups of people may face more serious risks from taking yarrow supplements. Yarrow is suspected of slowing blot clotting. That can be a problem, though. For instance, it's recommended that you stop taking it at least two weeks before a scheduled surgery. If you need emergency surgery, make sure the medical staff knows of this potential risk. In addition, it could be dangerous for people with bleeding disorders, as it may increase the risk of bleeding. If you have plant allergies but don't know for sure about this particular group of plants, talk to your doctor before taking yarrow. Yarrow is not recommended for use during pregnancy or breastfeeding. When taken orally, yarrow is believed to be able to stimulate a woman's menstrual cycle. That means it could put you at risk for miscarriage if you take it while you'll pregnant. So far, we don't know enough about the risk of yarrow during breastfeeding, so it's safest to avoid using it until after your baby is weaned. Yarrow is believed to have a negative interaction with the following medications. Lithium: Yarrow may cause this drug to stay in your system longer. Anti-inflammatories, anticoagulant/antiplatelet drugs: These can also slow blood clotting. Antacids and other medications that decrease stomach acid such as H2-blockers and proton pump inhibitors: Yarrow may increase stomach acid, and therefore, decrease the effectiveness of antacids. Avoid yarrow if you're taking any of these and be sure to talk to your doctor before adding it to your treatment regimen. While yarrow looks promising in terms of treating certain medical conditions, remember that anything that changes the way your body functions can be dangerous. Watch for side effects, allergies, and negative drug interactions just as you would with a prescription drug. Your medical care team can help you decide whether to include yarrow in your health regimen and, if you do, how to safely do so. Hajhashemi M, Ghanbari Z, Movahedi M, et al. 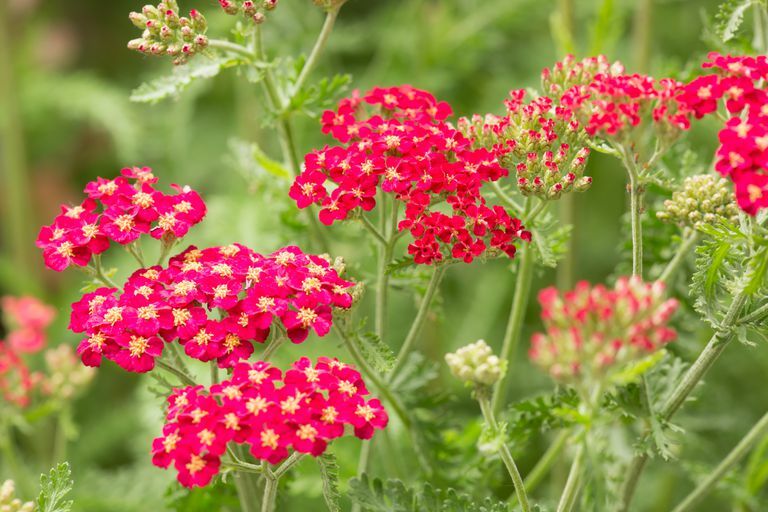 The effect of Achillea millefolium and Hypericum perforatum ointments on episiotomy wound healing in primiparious women. The journal of maternal-fetal & neonatal medicine. 2018 Jan;31(1):63-69. DOI: 10.1080/14767058.2016.1275549. Dorjsembe G, Lee HJ, Kim M, et al. Achillea asiatica extract and its active compounds induce cutaneous wound healing. Journal of ethnopharmacology. 2017 Jul 12;206:306-314. DOI: 10.1016/j.jep.2017.06.006. Mohammadhosseini M, Sarker SD, Akbarzadeh A. Chemical composition of the essential oils and extracts of Achillea species and their biological activities: A review. Journal of ethnopharmacology. 2017 Mar 6;199:257-315. DOI: 10.1016/j.jep.2017.02.010. Altinterim B, Danabas D, Aksu O. The effects of common yarrow (Achillea millefolium Linnaeus), cinnamon (Cinnamomum zeylanicum Blume) and rosemary (Rosemarinus officianalis Linnaeus) hydrosols on the some immunological and hematological parameters of common carp (Cyprinus carpio L., 1758). Cellular and molecular biology. 2018 Nov 30;64(14):19-24. Moradi MT, Rafienian-Koupaei M, Imani-Rastabi R, et al. Antispasmodic effects of yarrow (Achillea millefolium L.) extract in the isolated ileum of rat. African journal of traditional, complementary, and alternative medicines. 2013 Oct 3;10(6):499-503. eCollection 2013. De Sousa DP, de Almeida Soares Hocayen P, Andrade LN, Andreatini R. A systemic review of the anxiolytic-like effects of essential oils in animal models. Molecules. 2015 Oct 14;20(10):18620-60. DOI: 10.3390/molecules201018620. Ali SI, Gopalarkrishnan B, Venkatesalu V. Pharmacognosy, phyochemistry and pharmacological properties of Achillea millefolium L.: A review. Phytotherapy research: PTR. 2017 Aug;31(8):1140-1161. DOI: 10.1002/ptr.5840.